A year of fighting Nazis in Europe earned John Hutchison a chestful of decorations: the ETO ribbon, the good conduct medal, a purple heart and cluster (he was injured twice), four battle stars and the Luxembourg citation. He came home to Oil City, Pennsylvania, a genuine American hero at the age of twenty-one, and proudly wore his uniform when he married his girl, Thelma, exactly six months and one day after Adolf Hitler shot himself in the head. The army gave John an administrative job in Fort Indiantown Gap, a demobilisation camp in eastern Pennsylvania, where he and Thelma lived in married quarters. Before long, he left the army and moved back to Oil City, hoping to make his way in civilian life. That proved more difficult than he had hoped. He had been married less than two years when he got together with his older brother, Willard, and his sister-in-law, Audrey, and started to forge checks, using them to buy all the things he could not afford—fine clothes, shoes and jewellery for Thelma. 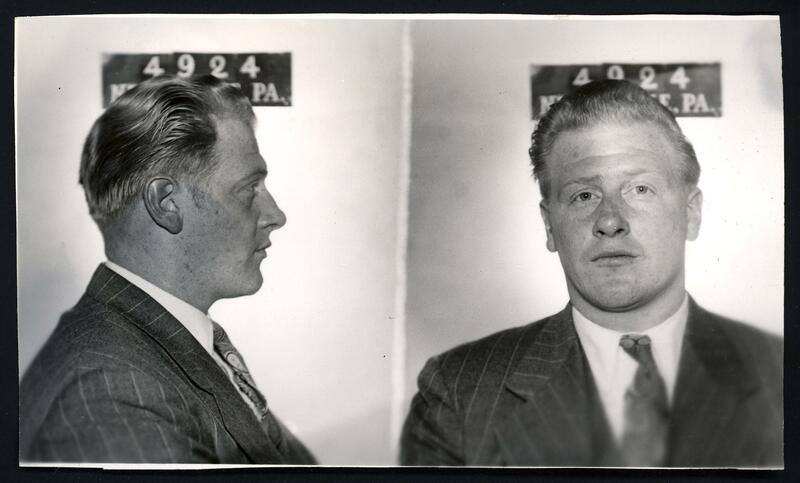 In March, 1948, John, Willard and Audrey were arrested for passing bad checks in towns across north-west Pennsylvania. In the past year, they had swindled more than $4,000 from shops in towns near Oil City. In New Castle, they hit two jewelry stores—King’s and Perelman’s—the Betty Gay clothes store, McGoun’s shoe store and Alexander Radio. Judge Braham usually handed down sentences of one to four years in jail for multiple counts of forgery. John, Willard and Audrey fared rather better. Throughout his life, even into his old age, Judge Braham would speak with sorrow of his younger brother, Hall, telling people that he was the first American to die in world war one and allowing them to infer that he had met his death fighting Germans in the trenches. However, the truth was that Hall had died of pneumonia in an army training camp in Virginia in 1918, not long after he enlisted in the army. He was not the first American to die in the war, either; merely the first from Lawrence County. When he died, Hall had been the age that John was when he appeared in court in New Castle. Judge Braham had been Willard’s age. The parallels might explain why, instead of beng sent to jail, the Hutchisons were let off with a $100 fine, on the condition that they made efforts to pay back what they had stolen. John and Thelma had three sons. John worked at the Worthington corporation in Oil City until the family moved to Fort Lauderdale, Florida, where he ran a motel. When he retired, he moved back to Oil City. He died in 1992, at the age of sixty-seven. Sources: The Blizzard, (Oil City, Pa) 1 Oct 1945, “Matrimonial” column; Indiana Evening Gazette, 16 March 1948, “Hold Three In Bad Check Ring”; New Castle News (19 April 1948, “Alleged Forgers To Be Returned”; 21 April 1948, “Fine 3 Forgers, No Jail Sentence”; 10 Jan 1963, “Distinguished, Learned, Eloquent Is The Judge”; 10 Jan 1918, “Hall Braham Gives His Life For America”). Thanks, Kurt. Glad you liked it. Brilliant research, as usual–and deeply compassionate. You always “get” the fragility, the heart, the beating core of the people whose stories you study. I admire that enormously. I do my best, Kendall. Thank you very much for your thoughtful words – I really appreciate them! My niece came across this article while researching information about her father ( my brother ) John H. Hutchinson Jr. , who died last year. I was completely shocked to find this out about my father ( John H. Hutchinson ) and my uncle and aunt. If any of my relatives knew of this, they never talked about it. My father had 3 sons, worked at the Worthington Corp. in Oil City until they moved out of town, and then moved to Ft. Lauderdale. He owned a motel there until he retired and moved back to Oil City. He was a past master of a masonic lodge and was very active in the community. This was so out of character for the man I knew, that I still can hardly believe it. I guess this must have really turned his life in the right direction. Thanks for writing, Jim. I can only imagine how strange it must have been for you to see this picture and read the story, having never previously heard anything about the arrest. I suppose it isn’t really the kind of thing that people tell their kids about. You should bear in mind that, in the forties, forging checks was incredibly easy. It’s remarkable that everyone didn’t do it all the time. I can see how someone who was desperate might start off forging small checks and quickly slide into trying to pass checks for bigger and bigger sums, once they saw how simple it was. I wouldn’t say that everyone would have done what John did, but I don’t think you’d have to be particulary wicked to do so. I guess the judge thought so, too. I’m glad you can confirm that John had a decent life after he dropped out of the news. It’s good to know. I just stumbled on your blog and have been reading the stories all weekend. I grew up in New Castle and was fascinated to read that one of the stores that received a forged check from these folks was Alexander Radio. The owner was My grandfather, Herman Alexander and the incident occurred about two months before I was born. During the depression, Herman built some of the first radios in his basement on Cherry Street in Mahoningtown and on Saturdays the neighbor boys would come to the house to watch him assemble them. His store, which later became Alexander’s TV and Appliance, was next to Strouss Hirshberg on North Mill Street. He lost his lease in the 60’s when Strouss took over the property to expand the store. Thanks for taking the time to write, Greg. As you can imagine, I’m a sucker for New Castle reminiscences, and that one’s exactly the kind I like. Thanks again!